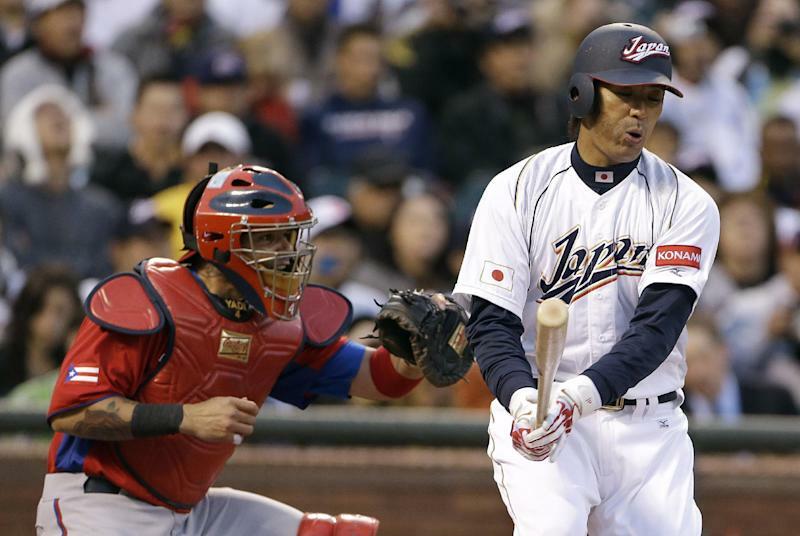 SAN FRANCISCO (AP) — Even with a roster devoid of major leaguers and a mere six months to prepare his club, Japan manager Koji Yamamoto still felt immense pressure to continue his country's dominance in the World Baseball Classic. This time, under far different circumstances four years later, two-time reigning champion Japan couldn't pull off a remarkable three-peat. Yamamoto took it personally. How could he not on a night Japan lost 3-1 to Puerto Rico after the tournament honored the WBC's two previous winning managers from his homeland? "Of course I have aimed for three consecutive winning championships, and I had some expectation that we would be able to do that," the 66-year-old skipper said. "But this is such a big international game, and it's been a while since I did the big international game. I did have pressure that I need to do this. However, this was a great experience being as old as I am. I was able to really feel the challenge of the match and being able to face this kind of challenge, it was really exciting." Unlike the two previous WBC winners from Japan, this team lacked international star power without the likes of Ichiro Suzuki, Daisuke Matsuzaka and Yu Darvish. "We were all domestic players from Nippon baseball," Yamamoto said. "It's challenging to get adjusted before the season, so as a team, despite the challenges, they really had the unity to fight the game." Hirokazu Ibata drove in the team's lone run with an eighth-inning single against Randy Fontanez, but Japan missed a chance with a costly baserunning blunder — a botched double-steal attempt. It also had the tying run at the plate in the ninth but Fernando Cabrera closed out the win. The surprising Puerto Ricans first eliminated the star-studded United States, then took care of two-time World Baseball Classic champion Japan two days later in the event's first semifinal. Now, Puerto Rico needs one more win to be WBC champion. Then, the country can throw a serious fiesta. "We totally showed we can be the new team, the champion nobody expected," said Angel Pagan, center fielder for the World Series champion San Francisco Giants. "It means a lot, but not everything, because we're still missing one more win." Alex Rios hit a two-run homer, Mike Aviles singled twice and drove in the game's first run, and Puerto Rico reached its first WBC final with a big assist from the bullpen. Relievers Jose De La Torre and Xavier Cedeno each worked out of jams while pitching key moments after winning pitcher Mario Santiago left in the fifth inning with a forearm injury. Team Puerto Rico will play in Tuesday night's championship against either the Netherlands or the Dominican Republic. Those countries meet in the tournament's second semifinal Monday night at AT&T Park. A Puerto Rico team that didn't even gather as a full squad for the first time until March 4 in Fort Myers, Fla., reached the championship round for the first time. Aviles hit a two-out bloop single to center to put Puerto Rico on the board in the first and singled again to start the seventh before Rios hit a towering drive into the left-field seats. A beaming Rios rounded the bases and reached home to a line of jubilant, jumping teammates eager to celebrate. 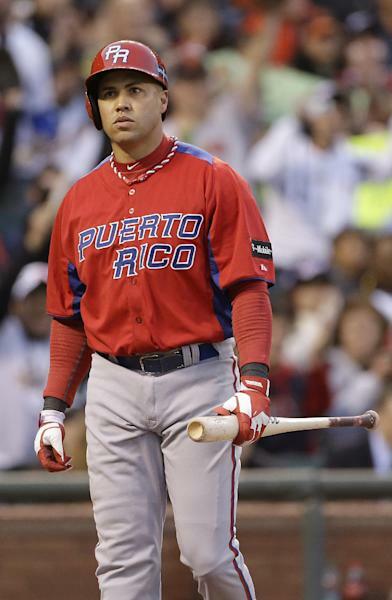 "It was a very emotional at-bat," Rios said. "We're very proud of what we've done. It means a lot for us and to our fans." The Puerto Ricans — who eliminated the U.S. on Friday night — certainly could have been road weary after playing the previous two days in Miami and making a cross-country trip to the Bay Area late Saturday, but Edwin Rodriguez's club looked nothing of the sort in stunning the favored Japanese. "We knew that we had something good going on after we got through the second round," Rodriguez said. "Coming here and winning and eliminating Team Japan, that means a lot. There are a lot of emotions. We know that a lot of people down in Puerto Rico are watching. This is a huge performance and a huge accomplishment for the people of Puerto Rico, not only for the players and youngsters but also for the people of Puerto Rico." 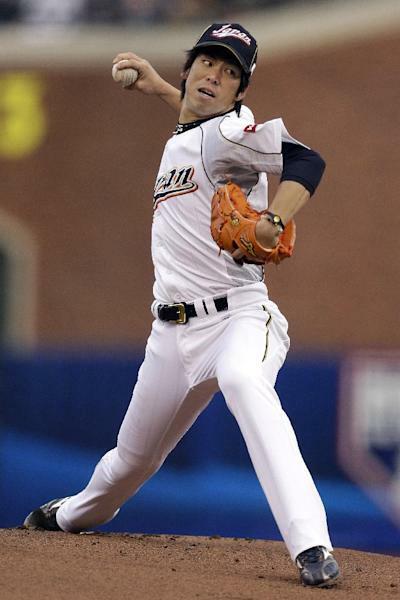 Aviles' first hit ended 10 scoreless innings in the WBC for Japan right-hander Kenta Maeda, and Santiago didn't allow a baserunner until Ibata's single up the middle with one out in the fourth. Team Puerto Rico played sparkling defense. Second baseman Irving Falu made a diving stop to his left to steal a hit from Yoshio Itoi for the first out of the fifth, then made another gem to end the eighth. That came after Japan's uncharacteristic mental mistake in which Ibata broke for third, then retreated to the bag as Seiichi Uchikawa already had neared second. Catcher Yadier Molina ran him down for the tag. De La Torre walked the first batter he saw before back-to-back strikeouts. That sparked Molina to jump and pump his fist in celebration. The fans were equally into it on a festive night that even included an Irish jig. Many in the animated, colorful crowd of 33,683 bounced in their seats while waving flags, blowing horns and pounding Thunderstix — and, of course, the usual cast of boats and kayaks packed McCovey Cove beyond the right-field fence. Team Puerto Rico eliminated a U.S. team of All-Stars with a 4-3 victory Friday in Miami and then sent Japan home empty-handed for the first time in the event's short history. After lining into a double play to end the second inning, Feliciano ran down Shinnosuke Abe's tough liner to left-center for the first out of the bottom half — with a noisy band playing just 20 feet behind him. Maeda hadn't allowed a run over 10 innings while giving up two hits with 15 strikeouts in two wins in this Classic. He allowed four hits and one run in five innings. The two former WBC-winning Japanese managers were in attendance — Sadaharu Oh (2006) and Tatsunori Hara ('09) — and each threw out a ceremonial first pitch, accompanied by Puerto Rican Hall of Famer Orlando Cepeda. Puerto Rico has beaten Japan in three of their four international meetings, including a 6-0 shutout on Oct. 8, 2011, in the World Cup at Panama when they last played. Japan is 17-7 all time in the Classic. Chants of "Nippon! Nippon!" were appreciated. "I really felt the warm support from the fans," Yamamoto said. "In this case, our opponent was really superior, both in pitching and hitting, and so we were cornered, in a sense."